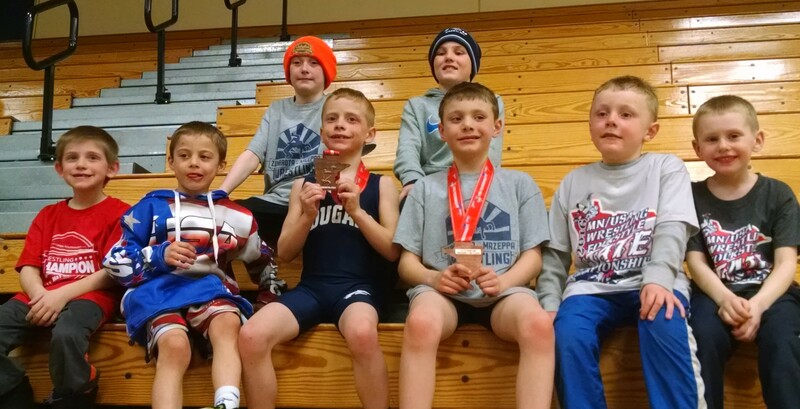 11 ZM wrestlers took part in the MN/USA Kids State Folkstyle Tournament this weekend. Jent Beyer and Cain Lexvold both reached the podium and placed 4th in their weight classes. Jack Haglund had a 6th place finish. Also competing were Leo Beyer, Cole and Lucas Schiell, Samuel Moore, Owen and Ryan Lexvold, Laiken Copemen, and John Poulin. Many Freestyle and Greco practices are underway. See last week’s post for more details. Monday- Youth open mat at 6:00. Tuesday- Youth open mat at 6:00. Register on-line for NYWA Individual Region Tournament by 5 PM (if qualified). Friday- NYWA Region in Byron for 5th-8th grade. Saturday- NYWA Region in Byron for PreK-4th grade. Sunday- NYWA Team Region Tournament in Eyota. Previous Previous post: Luke Tupper is MN/USA State Folkstyle Champion!